“Birds of Beebe Woods,” by Salley Mavor, from her blog at weefolkstudio.com. Highfield Hall will host a festive reception tonight (Friday, September 28) from 5 to 7 PM for two new exhibits: “The Intimate Woods,” which opened September 19, and “Beebe Woods: The Trail Leads to Our Door,” which opened September 26. Both shows are presented in conjunction with the 300 Committee, Falmouth’s land trust, in celebration of the 40th anniversary of J.K. Lilly’s gift of the 387-acre Beebe Woods to the Town of Falmouth. Both exhibits are inspired by the flora and fauna of the nature preserve that surrounds Highfield Hall, and both shows run through Friday, November 16. Annie Dean is the curator of both exhibits and will be on hand during the reception, along with several of the artists, to discuss the show. Cape Cod jazz pianist Mike Garvan will play at tonight’s reception, and there will be a poetry reading with a complimentary hand-made poetry booklet. Staff from Historic Highfield and The 300 Committee will speak, and refreshments will be served. “The Intimate Woods” features the work of ten regional fiber artists including Salley Mavor, Helen Koehler, and Joyce Shutter. 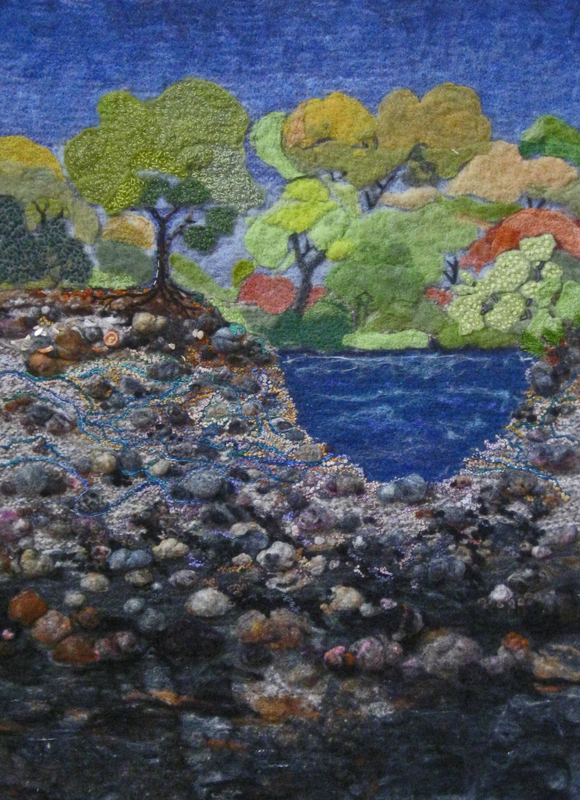 Using a wide range of media—from handmade papers, felting, beadwork and collage to various forms of fine needlework—these artists demonstrate the beauty found in nature. “The Trail Leads to Our Door” explores the botanical beauty, the geology, and the human history of Beebe Woods as interpreted in new work by established regional artists, including sculptor Ben Silva, painter Mary Moquin, and visual artist Erica Adams. Media ranges from intricate needlework to large-scale sculpture. The art exhibits promises to be a treat for both art and nature lovers—and on the Cape, that includes most of us! Highfield Hall is also offering a series of art classes, walks, and events in coordination with the exhibit. For more information, visit Highfield Hall.